5 Traeger or Yoder: Who Wins? Having a grill set up in your yard or on your patio/deck lets you entertain friends and family anytime you want. While grilling creates meats that are juicy and flavorful, you can create foods that are even more flavorful in a smoker. The wood pellets, wood chips and other materials that those smokers use impart lots of flavor into meats, vegetables and any other things you might want to cook. Traeger makes a number of smokers that also function as grills. These combo smokers are perfect for all homes and users with more or less cooking experience. You may want to look at how Traeger compares to Yoder, which is another leading manufacturer of grills and smokers, too. One thing you must know about these companies is that Yoder Smokers makes products that are only available from select retailers. In addition to shopping from certain stores or websites, you can also buy its smokers on its official site. This makes it harder to find unbiased reviews and to find some of the information that you might need. Traeger has more name recognition than Yoder because it sells its products through so many online sources. This lets you read customer reviews and see what they felt about top features. You can even take advantage of online deals and specials to save money on a smoker combo. When it comes to cost, there really is no comparison because Traeger smoker combos are so much more affordable than those from Yoder Smokers. Even the cheapest grills and smokers from Yoder cost more than $900, which is more expensive than the most expensive Traeger model. The main reason smoking enthusiasts purchase smokers from Yoder Smokers is because it offers products with a higher quality. There are the smokers that you can use when entering competitions and contests. Some smokers even come on their own trailers. While Traeger smokers may not help you win first prize in a competition, these smokers will help you make food for your next party. Traeger makes smokers in a range of sizes for whipping up foods at home and for cooking at a tailgating event or in a campground. Are you tired of listening to party guests complain because food takes too long to come off the grill? This can occur because you lack the space needed to provide guests with perfectly cooked food, but this Traeger TFB65LZBC Texas Elite 34 Series Wood Pellet Grill has a large grilling area that helps keep churn out all the food your guests need. The more than 600-square inches of grilling space inside include racks that let you cook food right over the heat and keep foods warm via indirect heat. With an auto start ignition, the Texas Elite 34 comes up to temperature fast and begins smoking your wood pellets in minutes. You may like that this grill comes with its own wheeled base and that you can remove it from that base for using it on your own counter or table. Trying to find a grill that isn’t too large and isn’t too small can make you feel like Goldilocks, but this Traeger TFB42LZBO Lil’Tex Elite Grill is just right for most users and cookers. At just over 20-inches long and just over 20-inches wide, this grill provides you with more than 400-square inches of grilling space, which will help you cook more foods and get dishes out faster. Its hopper and fire box work together to keep a constant stream of wood pellets moving through the grill and creating smoke and heat for both grilling and smoking. Many smokers feature some type of thermostat or temperature control on the outside that will require you keep checking that temperature as you cook, but this Traeger smoker has a temperature control feature that maintains the temperature inside for hours of cooking, smoking and grilling. With a cooking surface measuring 20-inches by 10-inches, the Traeger TFB29LZA Junior Elite Grill has a 300-square inch grilling area that can hold up to 12 larger burgers or a larger number of smaller burgers. That cooking space also gives you room for three rib racks or 18 hot dogs and sausages as well as a few birds. Its thermostat control, which works with the LED digital screen, works similar to your kitchen oven and lets you select an exact degree too. The Junior Elite is great for those who worry that they don’t have enough space for a full-size smoker. It features a wood pellet hopper that you can use for storing your pellets, an integrated fire pot that smokes the pellets and an ash bucket. 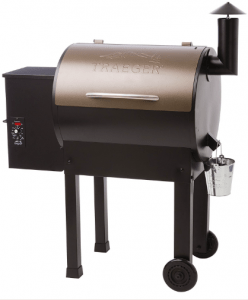 Traeger includes a three-year warranty on this smoker that covers all its parts. Most of the Traeger grills that you see are large in size, come with an attached or removable stand/cart and have a bronze lid, but this Traeger TFT17LLA PTG+ Wood Pellet Grill looks completely different from all those models. This grill allows you to grill and smoke anywhere you want to cook and has a design that will help you save on energy too. At 15-inches in size, this is the perfect grill for those who live alone, couples and those who want a smoker they can use in different settings. This smoker has a hopper that you will fill with wood pellets, but this hopper can hold so many pellets that you can kick back and relax without constantly filling it. Its shut down cycle takes just 10 minutes to run and makes cleaning the smoker easier because this cycle will remove some of the excess ash inside. Do you spend a lot of time at a stadium in your city as you root for your home team and celebrate their victories? Though you might think that you need to bring along a basic charcoal grill for those celebrations, you can choose the Traeger TFB30LZB Tailgater 20 Series Freestanding Grill instead. Designed for use in parking lots and athletic facilities, this smoker will make you one of the most popular people at any tailgating party. The Tailgater 20 Series Freestanding Grill has a fire box inside that produces smoke from the wood pellets you choose and will cook your food all the way through while leaving behind a nice smoke ring on meats. It has 300-square inches of grilling space and can accommodate basic things like burgers and steaks as well as rib racks, chickens and even turkeys. The top product from Yoder Smokers that is suitable for backyard cooking and grilling at home is The Kingman, which looks like the larger smokers that professionals use. It has more than 2,200-square inches of cooking space and can make enough food in one smoke or grill cycle to feed 100 people or more. The Kingman has a main chamber that sits in the center and has two cooking grates as well as a shelf that you can slide out. Measuring more than six-foot long and weighing more than 900 pounds, this grill is really best for those who cook large batches of food and those who cook for a crowd. It has a propane lighter that heats up the logs you’ll use for smoking and a basket that lets you use charcoal. The Kingman also has handles that stay cool, a heat management plate and a storage shelf on the bottom. Yoder Smokers heard from a number of customers who wanted a more compact smoker that wouldn’t take up a lot of space and designed The Stockton to meet their needs. This smoker is unique because it has an off-set fire box that sits on one side and a taller cooking chamber that measures 82-inches tall and gives you more than 4,300-square inches of cooking space. Unlike combos that let you smoke and grill, The Stockton acts like a traditional smoker. With the included basket, you can use wood, charcoal or a combination of both, and a grate built inside keeps logs from falling through until those logs break down into ash. The main chamber features eight different grates that let you cook foods at the perfect distance from the fire box and keep track of the dishes that you make. It also comes with temperature gauges that help you see the temp inside. With more than 1,000-square inches of cooking surfaces inside, The Wichita is the type of smoker that will help you prep and cook enough food for the crowds flocking to your parties and even uninvited guests who might show up. This grill features two distinct cooking grates inside the main chamber that you can use for cooking all those dishes that will wow guests or for keeping some dishes warm and ready for guests. Wagon wheels on the bottom of the grill come in handy when transporting the grill, and you’ll find a small storage shelf too. The Wichita comes with a cover designed specifically for protecting the grill from environmental hazards and weights that keep that cover from flying off and keep the door safely shut. At 6.5-feet long, this grill has a slightly traditional design that includes a temperature gauge on the lid and durable heating plates inside. Yoder Smokers recommends The Durango for those who routinely feed groups of 50 people or more because it has more than 1,100-square inches of smoking space tucked inside a vertical smoker. You can use some of the included grates to cook pork and chicken at a lower temperature and on an indirect heat away from the flame, but you can also move foods closer to the heat to cook those dishes much faster. A warming rack inside the vertical chamber is perfect for heating up dishes you made the night before or for keeping dishes warm until guests arrive. If you love sausages and other similar meats, you’ll love that The Durango comes with a hanging bar that allows the fats from those juices to drip away as the smoke penetrates those meats. Made from solid steel, this smoker has an impressive temperature range too. You can reduce the temperature down to just 150 degrees Fahrenheit or crank the heat up to 700 degrees Fahrenheit. Do you keep looking at products from Yoder Smokers and cursing your small yard or your small budget? The Cheyenne is a smoker from this company that can work with your budget and fit in a smaller space. With 703-square inches of cooking space provided by two grates in the main chamber, you can feed up to a dozen people with just one batch of food you cook inside. The Cheyenne has an almost old-fashioned look that features a large storage rack or shelf across the bottom, two legs with flat feet and two larger wagon wheels that let you move this 315-pound grill without straining yourself. It has a grate in the cooking chamber and a basket in the fire box for using the grill with charcoal briquettes. This Yoder smoker also has a propane log lighter, heat management plate and handles that stay cool to the touch when using the smoker at any temperature. Traeger or Yoder: Who Wins? As great as the products from Yoder Smokers are, we gave our seal of approval to Traeger. Traeger grills and smokers are available from Amazon and other websites that offer customers the chance to write unbiased reviews and to provide other shoppers with feedback about their experiences. As the smokers from Yoder are larger, more expensive and sometimes designed for pros, those products are better for those who want to enter contests or invest more in the hobby.